The story of Frau Holle begins as many faerie tales do, with an industrious "good" girl whose father has remarried a wicked stepmother and step-sister. The step-sister is cruel and lazy and so all the household labour falls upon the "good" girl. One day the "good" girl drops her spindle into the well, and fearing the anger of her step-mother, plunges into the well o retrieve it. Instead of finding death at the bottom of the well, she finds the realm of Mother Holle. Mother Holle rewards the "good" girl with riches and coats the wicked step-sister with pitch. But who exactly is Frau Holle? With Her realm in the Underworld, one must assume that she is associated with the Dark Goddesses of death and rebirth. Legends in some parts of Germany portray her as a toothless hag who appears in the winter, much like the Cailleach of Scotland. Frau Holle was described by Jacob Grimm (Grimm's Fairy-tales) as "a superior being, who manifests a kind and helpful disposition towards men, and is never cross except when she notices disorder in household affairs". In some Scandinavian traditions, Frau Holle was worshipped as the Earth Mother who was the spirit of the woods and plants. She was associated with Yuletide evergreen plants such as mistletoe and holly. In the Norse Eddas, she was described as Hlodyn, who gave gifts to women at the time of the Winter Solstice, or Jul. Frau Holle has also been associated with the fertility and rebirth Goddess Frigga who is the wife of Odin. 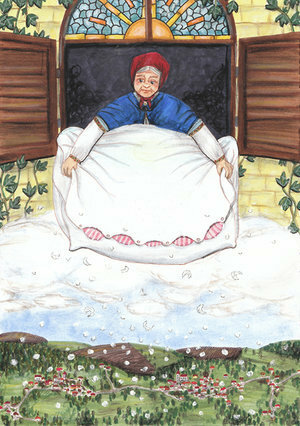 The Germanic folkloric traditions describe Frau Holle as being of the sky, be-girdling the earth. When it snows, she is making her bed, and the feathers of it fly towards the earth. She haunts lakes and fountains, and at noon may be seen as a beautiful lady bathing in the water. The entrance to Her realm is always by passing through a well. Frau Holle drives about in a wagon appearing in the time between Christmas and the 12th day after Christmas. This period of time is said to be when supernatural beings roam the lands. "We want to serve the great Diana, as our fathers did and in doing so, have prospered well to this day". The Goddess Diana of Würzburg was not the Roman Goddess Diana (who was never worshipped in Germany) but was in fact, Frau Holle. Grimm reported that many of the qualities attributed to Frau Holle were later attributed to the Christian Mary. There are a number of documents that prove Frau Holle's continued worship into the Christian period, such as Martin Luther's sermons raging against Holle, and Lanzkranna's reference to "Frawen Bercht" or "Frawen Holt as the heathen Goddess.